When I say God is good.... !! I am so thankful for all that God has done for me thus far in this year. I placed a huge dream in His hand and it is coming true! 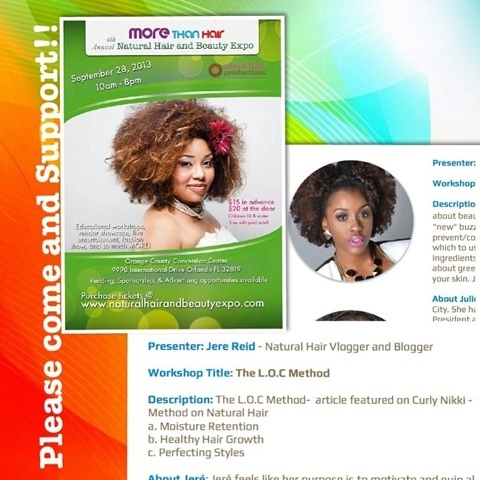 I am happy to announce that I was chosen to be a presenter at the Orlando Beauty and Hair Expo. I am beyond humbled and grateful for this opportunity. I thank God for all of you that support me by liking a picture, sharing encouraging comments, viewing a video, subscribing, following, and reading a blog post. I am overwhelmed by how God moves and works and I hope you all are living your lives as loudly as you can, dreaming huge dreams, and living in your amazing purpose! If you live in Florida, please come out and support your girl!!! I would love to meet you all on Sept. 28th at the Orange County Convention Center. Thank you again!!! Hugs and Love! !